The Crimson Petal And The White debuts tonight on Encore at 8 p.m. Eastern. It may be too early to tell whether it’s a coincidence, a trend, or the working out of a metaphor for our times that will come to seem really obvious in a few years, but the fact remains that an awful lot of ambitious TV these days carries the message: If you finish that time machine you’re building in your basement, don’t go to the late 1800s. Based on Michel Faber’s 2002 novel of the same name, The Crimson Petal And The White opens in London in 1874: Dickens territory. 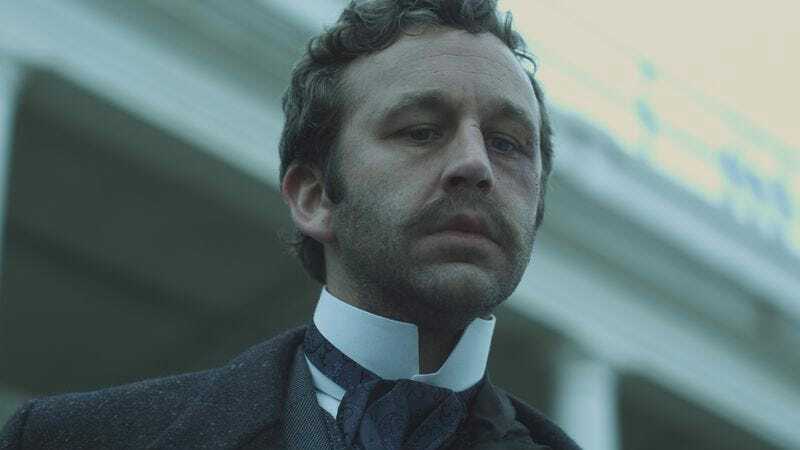 Like the book, the miniseries takes Dickens’ rage at the misery caused by poverty and economic and social injustice and gives it a feminist twist. Romola Garai plays the heroine, Sugar, who is especially well-suited to understand the ways that financial status shapes sexual relations, and vice versa. Born in a brothel, Sugar is 19 when the series begins, and has been on the job herself for six years. Through steady toil and careful study of her clients, she has turned herself into a legendary whore, someone whose name is traded and bandied about, in awestruck whispers, among wealthy, slumming gentlemen. Sugar sets about convincing Rackham that she’s invaluable to him, and she is: Not only do they roll around in bed together, she stiffens his spine and compels him to focus on the family business instead of his nonexistent writing career. (He, meanwhile, never suspects that she has a manuscript she’s working on somewhere. Looking at the ink smudges on her hands, he reminds her that he’s paying her well enough that she doesn’t need to take in copy work.) The heart of the story is this sexual relationship that has no love in it, though both parties pretend there is, for the sake of the man’s feelings and self-image. From her first glimpse of Rackham, Sugar sizes him up as a harmless fool, and the only thing that changes is that, when she gets close enough to perceive the full cruelty of the treatment of his neurasthenic, bedridden wife, Agnes (Amanda Hale), she realizes that he’s actually a harmful fool. Given the heartlessness of their arrangement, it’s a tribute to the actors that their scenes together are at all watchable. In fact, thanks to the performances, the show is quite compelling.